If you read the fine print, however, you'll see "Submits over SSL." The problem is that Yahoo has focused too much on the technical issues and not enough on the social ones. 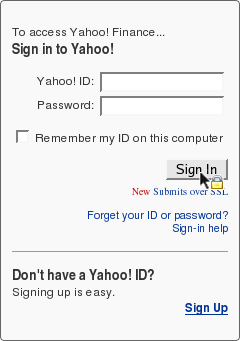 The average user looks for the lock icon when entering sensitive data into a form. Although it's not required that the login form itself be sent over a secure connection, the average user doesn't know this.